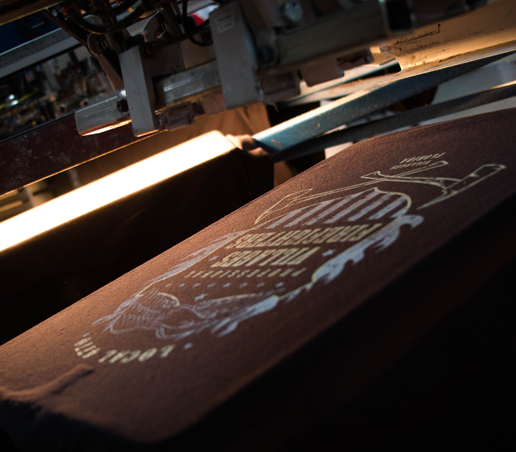 The Safari Sun team has ink running through our veins, as we live to create custom screen-printed apparel. 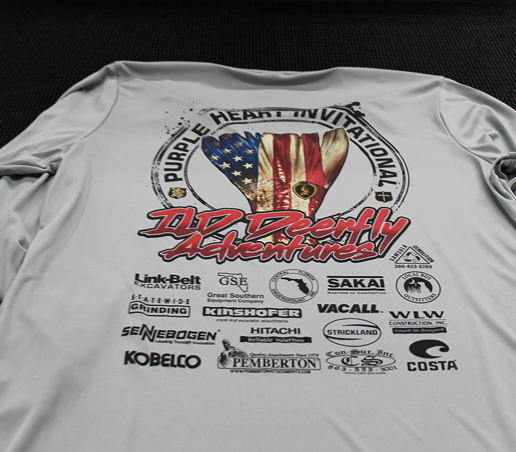 Screen Printing is most common decoration methods when it comes to decorating apparel. It is also known as silkscreen printing. This is one of the most durable decoration methods. When the screen print is done correctly it will last as long, as the life of the shirt. Screen print involves making screens for each color used in your artwork. To begin the process, we start by burning the vector artwork into mesh screens. The screens resemble stencils of your artwork. 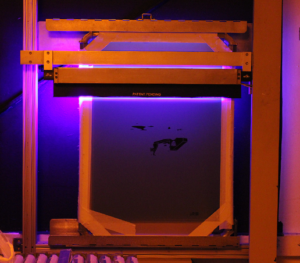 The screens are then loaded on the printing press where the ink is applied on top of the screen. 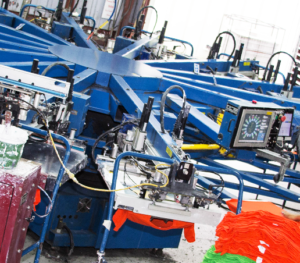 The shirts are then loaded on to the press where each screen is set over the shirt. The ink is applied in layers through the tiny holes of the screen, to create amazing depth and detail to each printed design. Then the shirt is taken off the press and run through the dryer to set the ink. 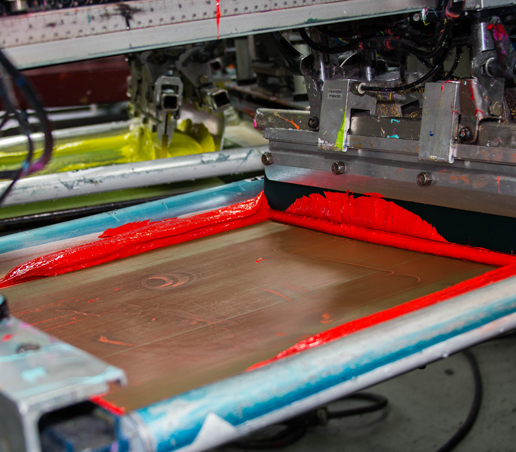 The screen print method produces the brightest vibrant color that can’t be replicated with any other printing methods. The longevity of the print also outlasts other printing methods and is the most cost-effective for large orders. Why Safari Sun for Screen Print? 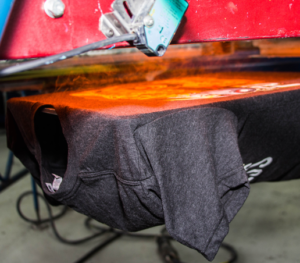 All of screen printed garments are produced in-house to make sure the highest quality standards are met on every garment. We aren’t just an online company that takes your order and outsources it for fulfillment. We handle all stages of the order process in-house from customer service to production. We know exactly was is going on with your job through all stages of the order process. Our up one of a kind computer software tracks your order from start to finish and allows to make changes when needed. Safari Sun cuts out the middleman out to help give our customers the best price possible. Our experience, quality, and speed help set us apart from other screen print shops. We are truly screen print experts. With over 30 years of screen print experience, we have printed all the latest trends in the industry throughout the years. We keep our fingers on the pulse of the fashion industry. 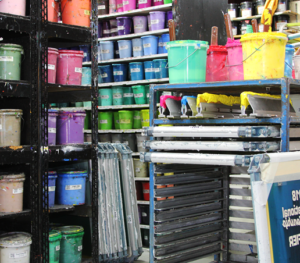 This has lead us to offer specialty processes and inks that not every screen printer has to offer. 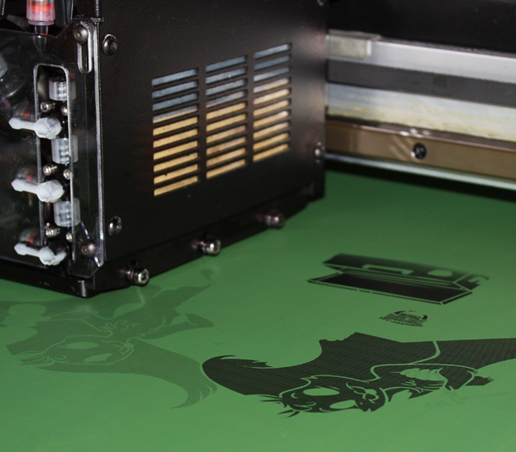 From Glow in the Dark Ink to Metallic and Glitter, ask about our specialty inks to give your design a special touch. 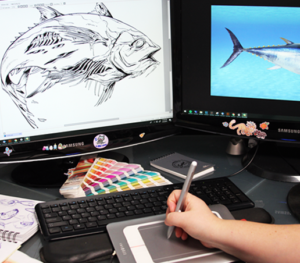 Our artist know all the tiny details of how to design screen print artwork to minimize color count and how to blend colors, when layering them on the screens. Our production team has the knowledge of how fabrics react to heat and how certain inks will respond to certain fabrics. Our experience combined let us know what issues to look for before they happen to help cut down on production times and to bring top quality to your prints. 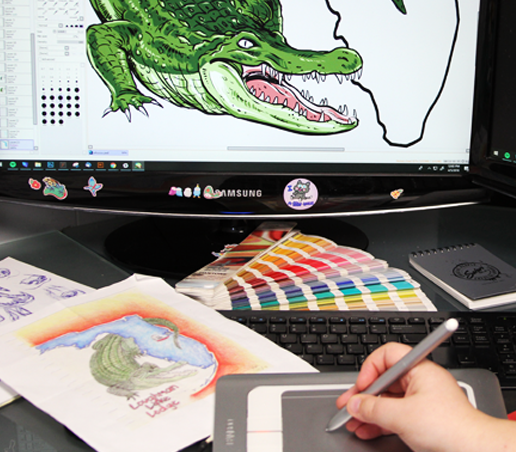 We use all the highest quality screens, inks, and separations to ensure high quality photo reproduction. Quality control is one of our top priorities. We inspect all garments before they even go on the press. When the production team sets up the designs on the press the production manager does a test run of each design, to make sure the registration of the screens is clean, and the inks are the exact colors they are supposed to be. 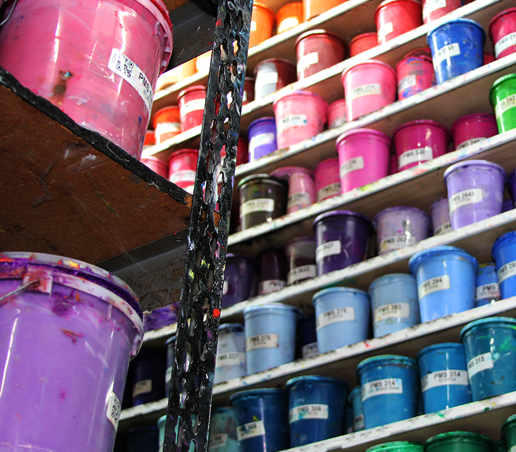 We also have an ink department with up to date technology to know how-to match PMS colors exactly. Each manager checks the first test print against the virtual proof, so you know exactly what your print will look like before it’s even printed. Once the garments come off the press each garment is carefully inspected one last time before being packaged. Quality will always be one of our top priorities because we take pride in our work and making our customers happy. 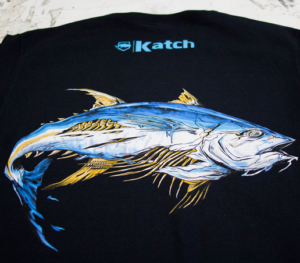 Our printing ability is 1,500+ shirts per hour and we have the resources to print up to 100,000 shirts in a single week. We have four automatic screen printing presses for large jobs and one manual press for smaller jobs. Our paper-less order management system helps our team track your order from start to finish. Rush is a word we understand, and time-sensitive orders will be given undivided attention to meet your specific deadline. Our experience has led us to be more efficient in our production times because we have the knowledge to look ahead and know what challenges lie ahead with each job. We then plan for those challenges and know how to handle them. Our shop is constantly moving with many parts of the production, we work together as a team to make sure all stages of production meet their deadlines and we still have time to pay attention to detail.